The discussions continued post-lunch in the Playbook Roundtable led by Girish Mathrubootham, CEO and founder of Freshdesk, organized at the Freshdesk office in Chennai. During the extended session, Girish outlined the sales and marketing structure in a SaaS business. While this may be only taken as a pointer to setting up the sales and marketing teams, each business owner needs to focus on the appropriate strategy that brings him the maximum number of customers. As explained in the last report on this roundtable, firming up the business model after iterations and adaptations is very important before a SaaS business would scale. Remember the product is the key. And when the celebrated investor Andreessen Horowitz featured in his blog Mark Cranney’s “If SaaS Products Sell Themselves, Why Do We Need Sales?” it kicked a lot of debate on why Cranney is right. Some strategies outlined by Girish might be of great help in not only positioning your product but also making sure that customers continue to use it after they buy it. The Q&A format continues. 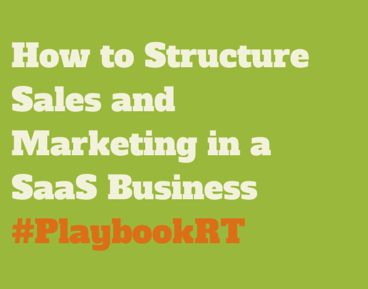 How do you structure the sales function? The sales function has two components: inbound sales and outbound sales. For inbound sales, the ability to identify good people to fill the position is absolutely essential. If they have capabilities of researching on the customer and can write personalized mails, that works better than lifeless common mailers. Further, the response rates increase in case of personalized mails although it might not convert into sales immediately. The inbound sales guys should be able to identify themselves with the customers and a “We” pitch infuses confidence into the customer’s mind. In all, inbound sales people should be able to make the customer feel special about interacting with the product and the organization behind it. Outbound sales is a pure arithmetic in one sense. Read Predictable Revenue by Arnold Ross. If you invest x amount of money, you harvest an amount y (usually as multiples of x) as revenue. To be able to achieve this, you need to have a structure sales organization inside the team. It could be divided into market research team (which identifies potential target sectors and customers), sales development team (which continuously interacts with the customers to understand their requirements and explains to them how your product can address their needs), and an account executive team (which specifically oversees one or more specific customer accounts). This should be supported by the pre-sales team. People are key to all the roles mentioned. It’s important for the CEO or the senior management to identify who is good at what and then placing them at the position they can perform best. If someone is capable of creating a good rapport with the customer, move that person to pre-sales. Some people show an inclination to solve problems. Put them in the support team. A small hint about shifts. Keep the people in the same routine, which means keep them in the same shift they come in. Some people like night shift and if they want the night shift, keep them there. Rotating shifts might need to unnecessary resetting of biological clocks of the shift people that might show up as poor performance. Be wary of this. Should you hire a salesperson in the US? This question continues to create varied views in the minds of SaaS entrepreneurs who find the US market attractive for their product. The right answer is it depends. If you are able to close the deal through online and telephone interactions, it’s good and some big deals might also happen. But it’s not a scalable model. A salesperson in the proximity of the customer at times becomes necessary to go after big-ticket size deals and close them. Customers feel confident about having a support person near them. It also involves cultural and mind-set issues and the customers become comfortable with the organization present in the same country as them. It would be better if you would hire a person after you are sure that big ticket size deals would happen. The salesperson should be capable of going after big deals and closing them. One note of caution: Make sure your sales person is working full-time for you and not moonlighting. What is the final word? Again, it depends. The best option is to hire a full-time sales person in the US for closing big-ticket deals. Beware of the cost of the sales guy and the difficulty of getting sales out of them. There have been bad experiences for some. Maybe learning about that helps and also get tips on how to hire the sales guy in the US. There is no one strategy that works and it’s largely your own learning curve. But some pointers from people who already have a sales team or a sales organization in the US helps. Sales people are either hunters or farmers. Hunter sales people hunt for new customers and go after new domains aggressively. Farmers have the ability to nurture the existing customers. It’s important to identify a person’s skill and decide where they fit in the sales organization. Read Jason Lemkin’s interview on SaaStr.com. Retargeting customers can be done through Google mail. Don’t overdo mass mailers. You run the risk of Google labelling you a spammer. Write personalized mails. Remember, a closure of sales that results in a recurring revenue (for example, through subscriptions) converts into a higher revenue over a period of time, without the need to add new customers for an increase in the revenue. What is the role of marketing in a SaaS business? The marketing team should generate qualified leads, which the sales function also should do. Both of this converts to good sales. Once you identify your target, make sure you gather a valid e-mail address and a valid phone number. There are ways to do it. Learn them. Social media helps a great deal in lead generation. Customer acquisition happens. If you are looking at competitor social media feeds, you at times spot an unhappy customer, who wants a specific feature or has a need, which your product fulfills. Instant connectivity on Twitter facilitates this connect. Trap them and convert them into your customer. A step-wise filter for tracking leads works wonders. Right from a prospective customer approaching your product through your website, keep track of the customer to see what is he interested in the product. If he shows more than a mere curiosity interest, track him to see the various levels at which he interacts with the product. Sometimes, customer might return after sometime. Help the customer in whatever ways possible to convert him into a buyer of your product. How free should be the free trial? Various strategies work. The free-trial period varies between 6 and 11 days. Look for an optimum number. Any amount of free trials is not going to hurt your business. Think of a longer horizon of the free trial. Say 30 days. This is a feel-good or hygienic factor that keeps the goodwill of your business with the customer. Provide support during free trial and try to educate the customer in what he doesn’t know. You will earn respect and convert a doubter into a customer. Be disciplined to knock off “parasitic” customers. Keep track of customers on free trial nearing their free trial period. If your plan is to close their account, send a polite mail announcing that their account will be inactive after x amount of days. Make it as if it’s your company’s policy to delete accounts that are dormant for a period of time. Sometimes surprises spring up. The customer might sign up. Periodically getting rid of customers who don’t bring any value to your business is a good idea. If you want to expand into a new geography, do your homework thoroughly. Study the terrain in depth before setting your foot in. You must know where you are getting in and what segments you are targeting. Understanding the culture and business practices in that geography works immensely. For example, Australians want you to call them, whereas the English wouldn’t encourage that. Acquiring a big customer at the beginning is thrilling. But weigh your options clearly before signing on the dotted line. If your sales and support would not be able to cater to the needs of the large enterprise customer, you are better off saying “no” rather than change your business model and focus your energies on one customer. You may not be able to scale instantly on demand. Never significantly or drastically alter your business model for one customer or for one big breakthrough. It would eventually hurt. Seal the lower end. But the lower end is always going to be cannabalized. Beware of competition and remember you can’t be cheaper than free. Normally, there is a problem of customers falling off after, say, a couple of months. So it is better to have a customer onboarding team to track sign-up. Live tutorials can handhold the customer for the initial period of using the product. Videos are helpful for non-tech customers. Don’t disturb the core tech team for small technical glitches. Customer Action Response Team (CART), which fixes small bugs, is a great strategy. Focus on fulfilling customer expectations. Remember, when you solve a customer problem, you earn a happy customer. To take a cue from Jeff Bezos, hire people who are not able to say “no” in customer development and hire people who say “no” in business development. Empathy is a great trait. Empathize with the customer and their problems and see how best you can solve them. It’s always best to “farm” the first top 100 customers or key customers who bring 80% of your business. Remember, 20% of the customers bring 80% of your revenue. Focus on them. With everyone in the room taking away valuable lessons with them, the roundtable wound up on a happy note. CategoriesContent & Marketing, Playbook RoundTable, Sales TagsCustomer Action Response Team, inbound sales and outbound sales, Jason Lemkin, SaaS business, SaaS products, salesperson, scalable model.